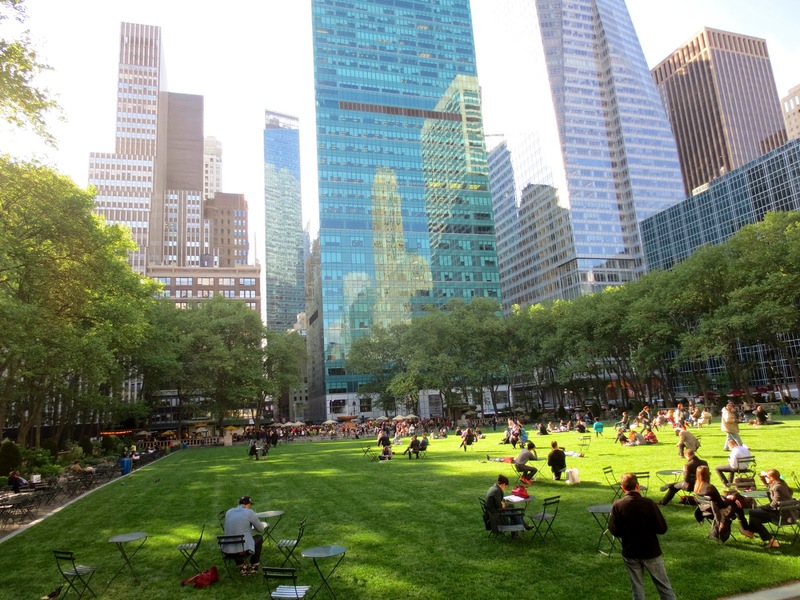 An urban oasis several feet from New York Public Library, Bryant Park is an ideal resting spot for the thousands of tourists and residents who pass by its boundaries each day. The French classical style urban oasis is much more than a charming back porch for the Public Library's main branch. Read the beginning of the story in my Post 1 and Post 2. In 1935, in the middle of the Great Depression , the Bryant Park Open-Air Reading Room was established in the backyard of the New York Public Library. By its second summer, it had attracted 64,624 visitors. The 1935 Reading Room consisted of several benches, a few book and magazine cases, and a table with a beach umbrella for the five librarians who ran it. In 1943 the reading room was temporary discontinued. The parks commissioner Robert Moses wrote:” … we can open it again when the war is over.'' 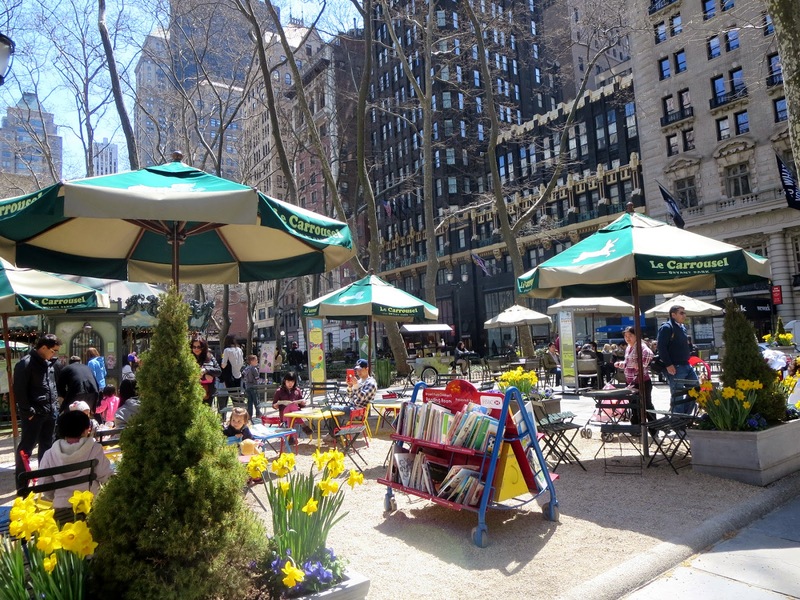 The Reading Room at Bryant Park was reopened thirty years late, in 2003 and HSBC was its first sponsor. The programming, publications, and environment of the Reading Room are available to everyone for free, without any need of cards or identification. 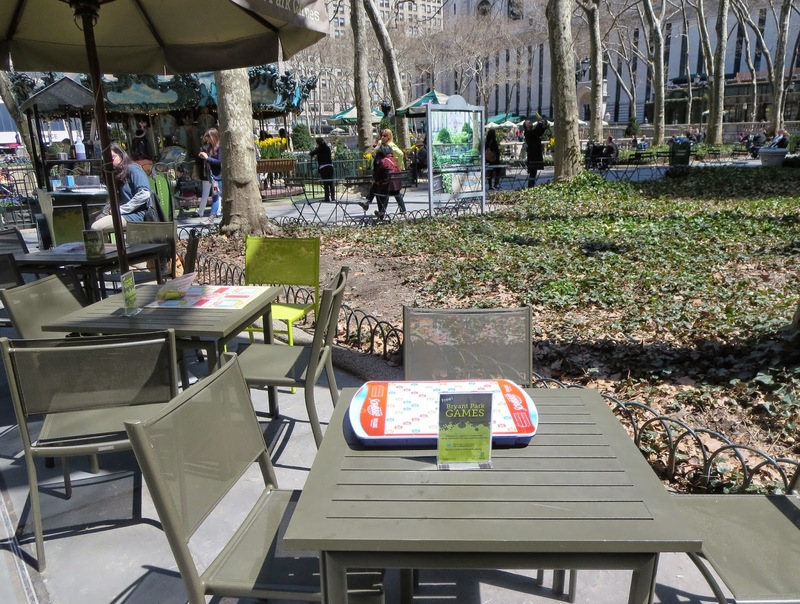 Bryant park gave room has over 40 tabletop games available daily for free including Quoits, Scrabble, Chinese Checkers and Scandinavian Kubb. With almost 40 different games in the park, there is something for everyone. We have a selection of classic board games, childhood favorites, and new popular games available for free. The games attendant helps to get started, explain rules, and help set up equipment. The park has a chess concession at the west end that offers chess boards and lessons. There is also a court for practitioners of Pétanque, the French game of boules. Also popular are free classes in juggling, yoga, tai chi and knitting. 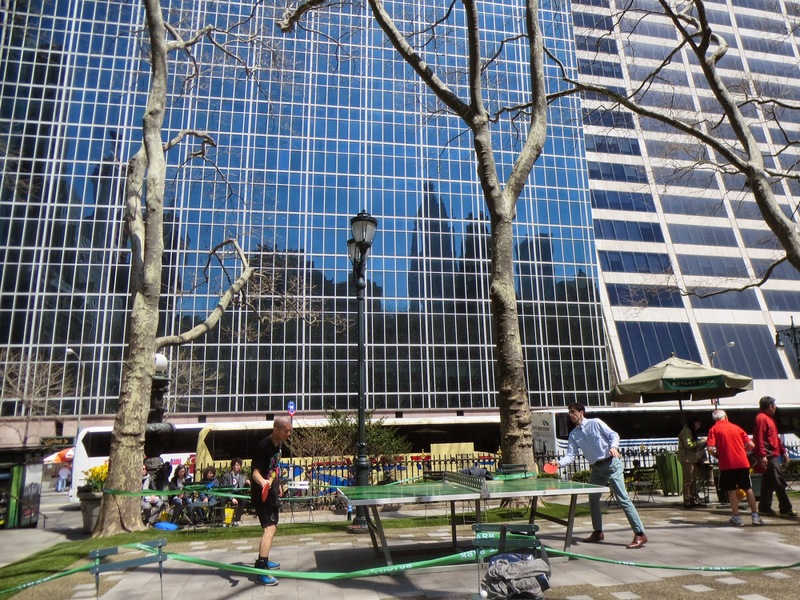 In the summer of 2009, the Bryant Park corporation added two ping pong tables to the North West corner of the park. 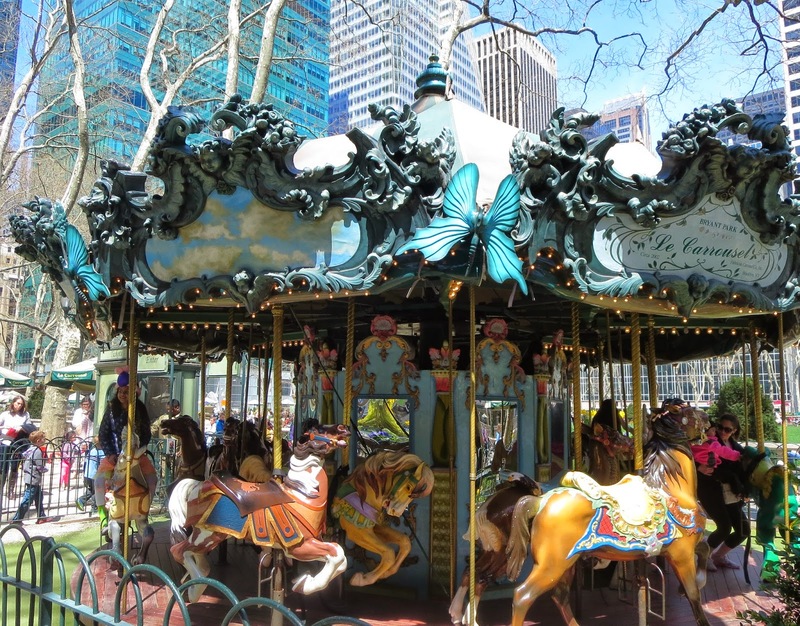 Le Carousel in Bryant Park was designed specifically for Bryant Park by Marvin Sylvor of Brooklyn based Fabricon Carousel Company. Sylvor has designed more the sixty carousels worldwide and this one was his favorite. There are 14 animals (the rabbit, 10 horses, a frog, a cat and a deer) that revolve to French cabaret music. The price is $3 per ride. And a parent assisted the child rides free. There's something always happening in Bryant park! 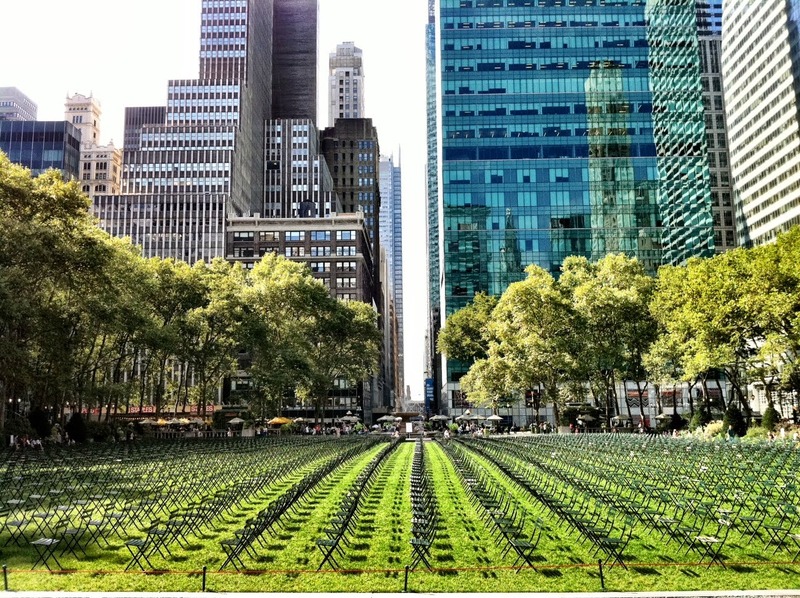 On September 11 2001, Bryant Park set up 2,753 empty chairs in honor of those who died in the 911 attacks. 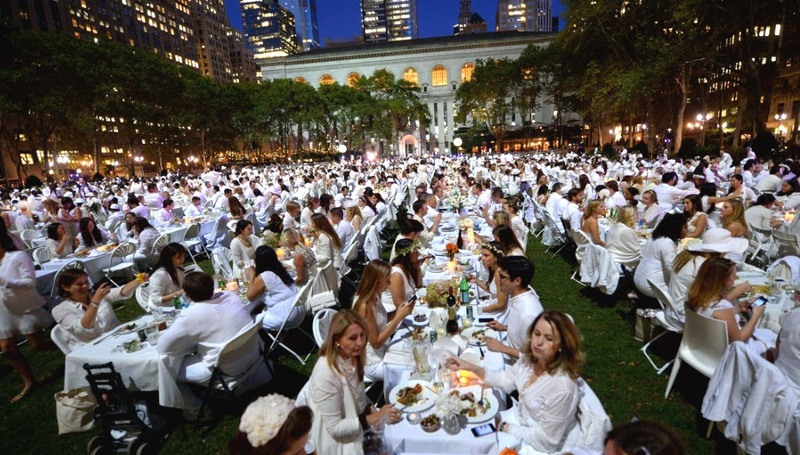 On Wednesday, September 20 2013 some 4,000 people, dressed all in white, have come to dine in Bryant Park. They have come for Diner en Blanc, an unusual pop-up event that takes place in 20 countries. The guests eat at a location they only learn about minutes before they arrive. The thousands wave white napkins to signal the beginning of the event. This is the third year that Diner En Blanc has come to New York. 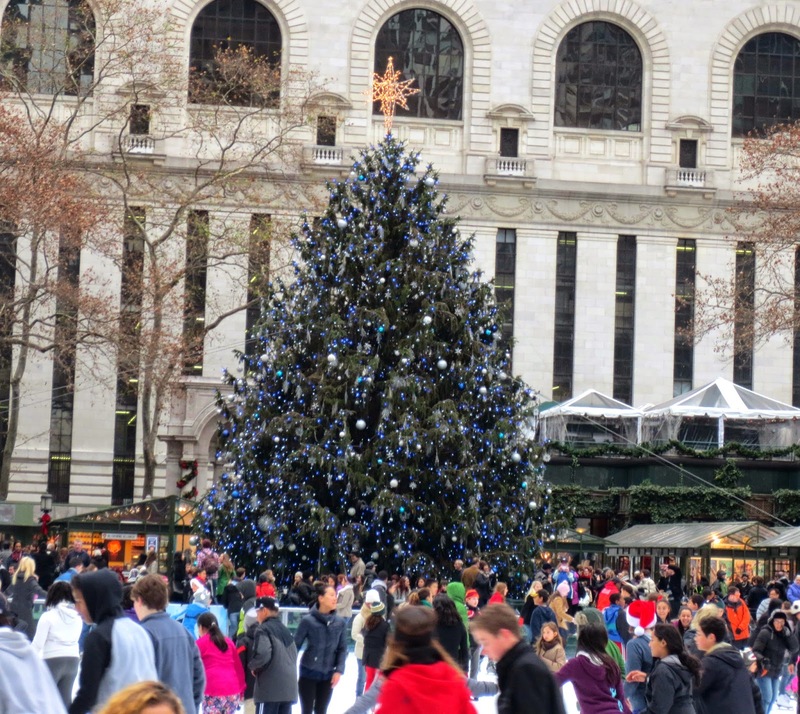 Bryant Park is great at any season of the year. When the weather is warm, it is a great place to come relax, read a book, or catch an outdoor movie. 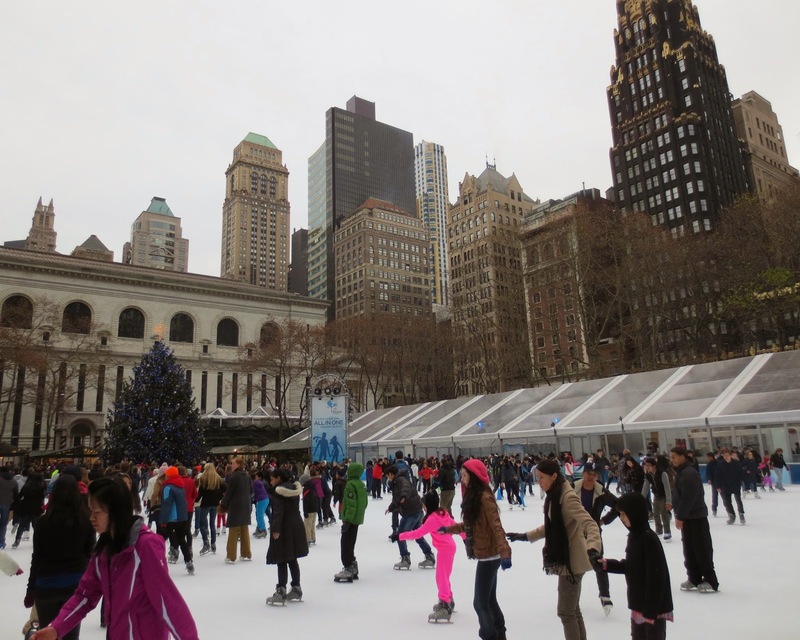 During the winter months, it turns into a winter wonderland with gift shops all over the place, large Christmas tree and free ice skating - you have to pay only for skate rental . Every summer on Monday night in June, July and August you can see classic movies on the big screen under the stars in Bryant Park for free. You have to bring a blanket - chairs are not allowed in the lawn. In 2002 the park became the city's first 'wireless park', which means you could connect wireless to the internet from anywhere in the park. Bryant Park Grille has one of the prettiest settings for a restaurant in New York. Pricing is very reasonable and there is an outdoor patio garden and rooftop garden. 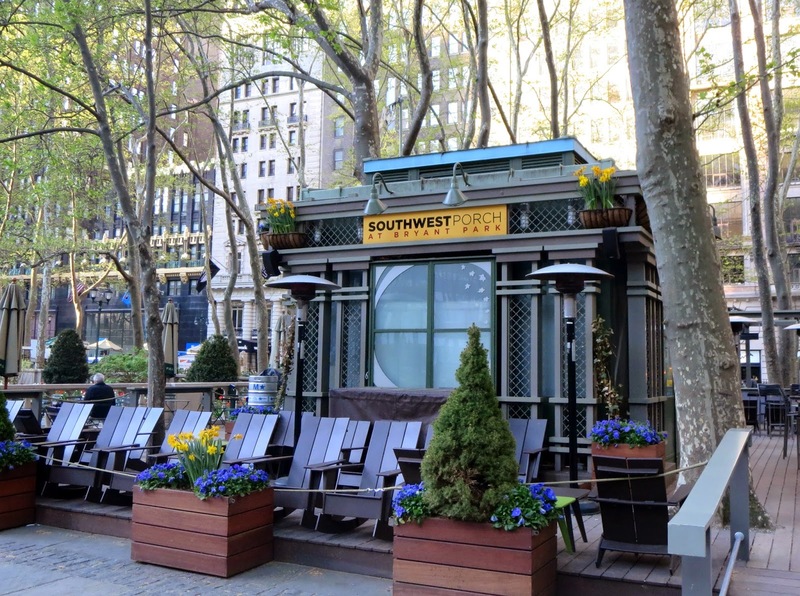 Since the summer of 2005, Bryant Park's kiosks have been serving up delicious handmade food to park-goers all year round. There a coffee kiosk with handcrafted pastries and breakfast items such as steel-cut oatmeal and Greek yogurt. There is a the Grilled Cheese kiosk and Soup and Sandwich kiosk. 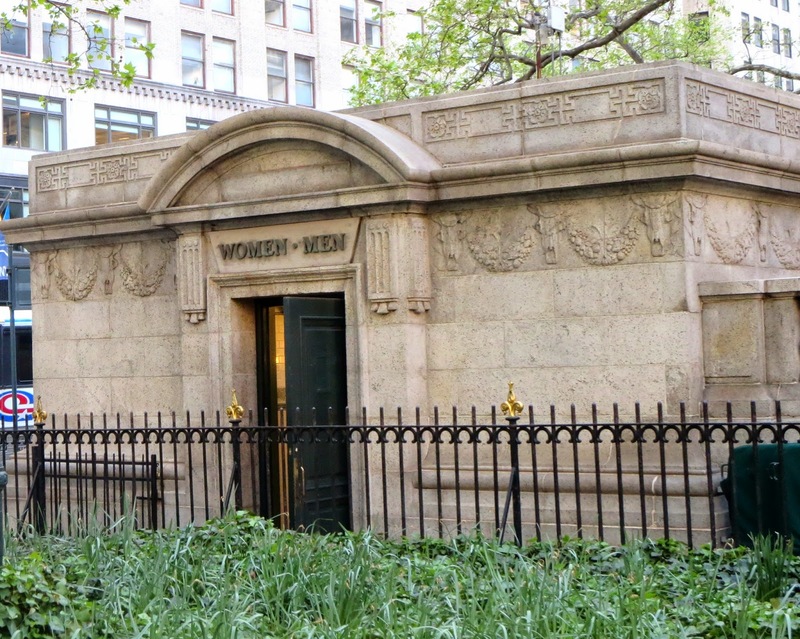 And the last but not least thing I’d like to talk about Bryant Park public restrooms. The free public restrooms were completely renovated in 2011. 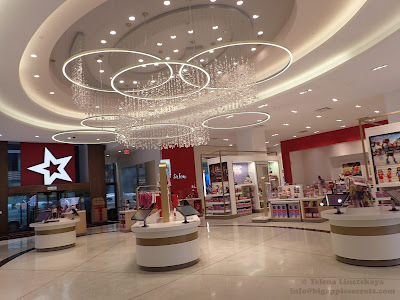 You can find fresh flowers on the marble countertops, attendants and a classic music inside. Public restrooms were recently voted number one in the world by travel website Virtual Tourist.